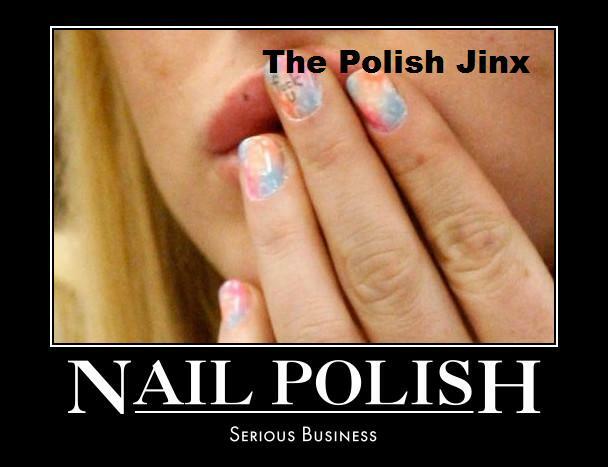 The Polish Jinx: Which Bloggers Do You Read? I have started and stopped this post many times in the last week. But due to recent events I feel the need to discuss this. I am the first to admit I am not a guru or an expert in anyway shape or form. My opinions are simply that. MY OPINIONS. I have no expertise, no education in makeup or nail polish (though I am in the middle of a chemistry degree!) and I basically just talk about what I love and what works for me. I am not an expert writer. My grammar is not anything special, nor is my spelling or vocabulary (which never ceases to amaze me considering how much I read!!). But I blog because I love it and am always careful to make sure what I promote and talk about are things I truly like and believe in. 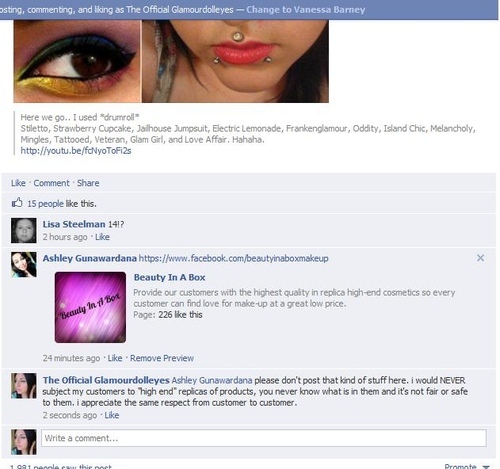 So when I see a blogger promote using illegal and fake makeup products I sit up and take notice. This bothered me so much. I will be the first to say - I don't necessarily object to fakes. I KNOW they are illegal, but I will admit I have purchased some sterling silver pieces that were fakes. I didn't want to spend $850 dollars on a necklace I was in LOVE with and found a piece from China that was IDENTICAL (and had the fake logo) and it was $8. I had it tested when I got it (cost me $20 to test!!) and it WAS sterling silver. But it was not makeup and I was assured it was indeed sterling. 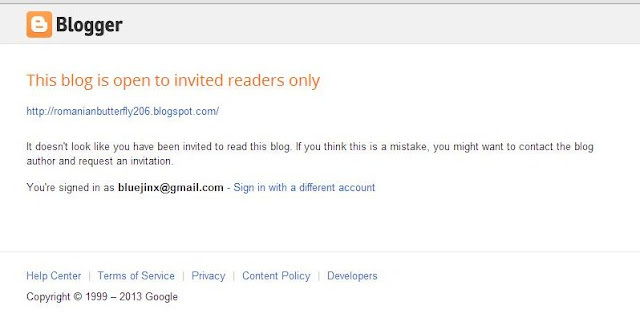 But I would never share the link (unless specifically asked) and I will publicly admit its illegal and wrong. 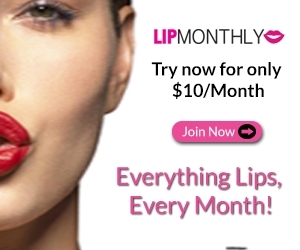 But when someone posted a link to a fake Urban Decay Naked palette for $10 bucks in a Facebook group I am in, I was stunned to see a MAKEUP BLOGGER say go for it! I was stunned. I piped in (as you know I have a BIG mouth!!) with all the risks and things that could go wrong. 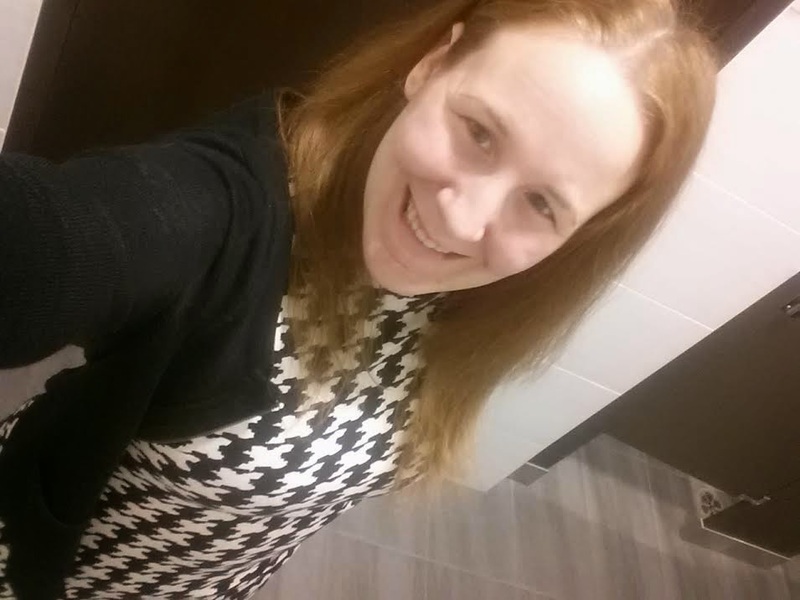 This blogger was THANKED for her advice to try it! REALLY??? I went to investigate her blog a little closer. Her disclosure was cut and pasted from a different blog (that is conveniently a private blog that is not accessible to the public). This was the first red flag that something was not entirely right in whoville! Then I saw this and got really offended. I mean, asking for donations to go on a trip? I personally find that so trashy. I have donated a few times to a few great causes. But so she can go fly to New York for a few days? Since my commenting on that she has since deleted this page from her blog. And then I started getting comments from others when they saw my disagreements with her in the group. One pointed out how many posts of hers she lies in and states she bought things when they were sent to her for review. Or in posts where she just "forgets to mention" it was sent to her for review. I have no proof of this and can not say if it is true or not. But I was sent some examples. NOWHERE did she say she got this for review...because this wasn't even sent out until the end of November? This was posted October 22. The disclosure says it was purchased by her. But when someone inquired with the company they were told a select few bloggers were sent some for review ahead of time but that the only other way to get them was to purchase it when they went on sale. Another issue I have is with sincerity. I post blog reviews that are products I have been sent for review every so often. Some get rave reviews (hello, Darling Diva?! LOVE!!) some get really poor reviews. But I would never review something and say it was good if it was not. Whether I paid for it or not! Awhile back this was posted by Ashley. Apparently, she was unhappy with a company that had sent her a few boxes before deciding they didn't want her reviewing her products anymore. I wondered why it had suddenly become a private vlog only viewed with her permission. Seems according to Ashley in her own words is that spicy immediately contacted her and offered her some kind of deal and she then changed the stats to private. That is what SHE posted on facebook about it. It has since become public again after pressure from people asking her where it went. I am unsure if she still gets free boxes, but she said she was going to continue reviews to milk them out of free boxes. Now, on January 20th (3 days ago) this showed up on her blogs wall. I don't know about you, but if I dont like business practices of a company, I STOP supporting them. Since everyone knows my feelings and opinions on RBL I will use them for an example. If Ji herself phoned and offered me one of every polish in the entire Rescue Beauty line, I would say NO. And I refuse to send any business her way. 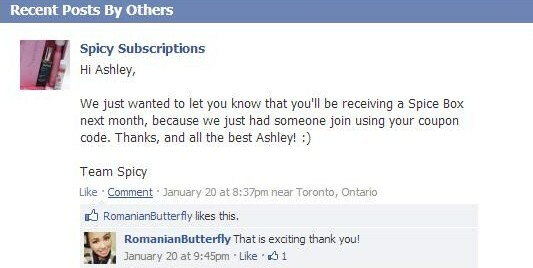 Now most beauty junkies have subscribed to or at least seen many different Beauty Subscription boxes. I am a Julep Maven myself. But it appears that someone started a box offering luxury MAC, Benefit, Dior and other high end makeup in a $25 subscription box. It got removed from facebook a few times and has gone under a few different names including Ready Steady Go Makeup! and Beauty In A Box Makeup. 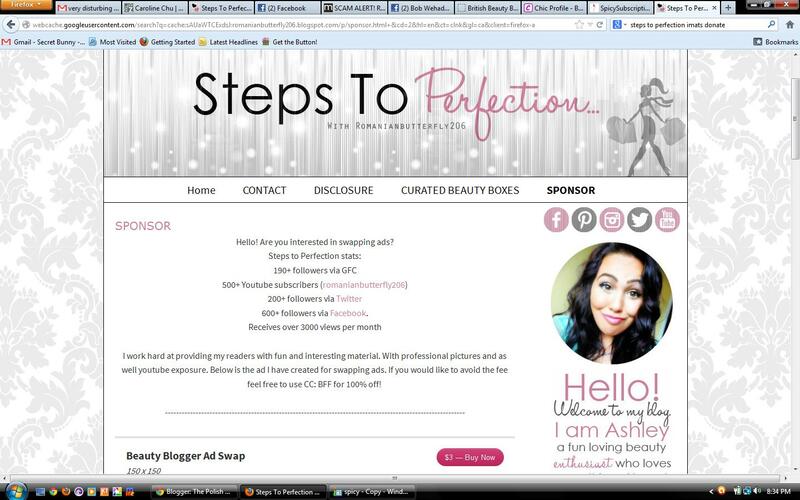 I had heard of them through this blogger a few times but did not realize that they were FAKES! I assumed that the blogger must obviously have not realized that they were fake products. How could you promote that to your readers if you knew? Well....... let me first show you some screen shots of the brands advertising. Maybe she missed that? Maybe she assumed by replica they meant dupe? And it was a different legal brand? I feel its better to give people the benefit of the doubt and not jump to conclusions. So what if she was promoting it? Hmm....... Then someone did some research and came to the conclusion that the person who was actually selling these boxes? You guessed it. According to this link (you have to read through most of the first page) is none other than Ashley herself. THAT LINK IS HERE! 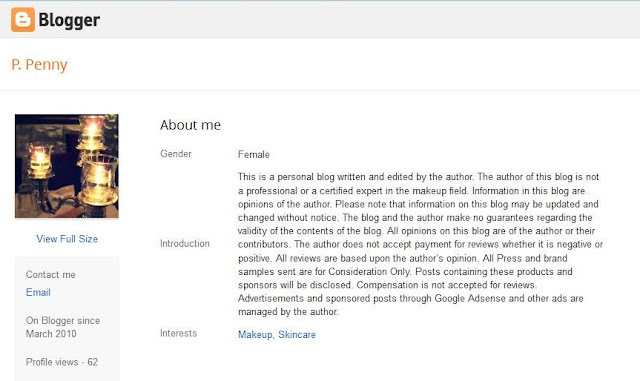 I have ZERO affiliation with this blogger at all, but it will not be a blogger whose reviews I personally take in to consideration before making a purchase. Thats just me though! OMG! This is unfreakingbelievable! I can' believe some people would stoop to the level she does as a blogger. I will keep an eye out for her and her blog! Thank you for writing the post! Thank you for the heads up. I have run across this myself but at the time it did NOT have the replica tag in it. 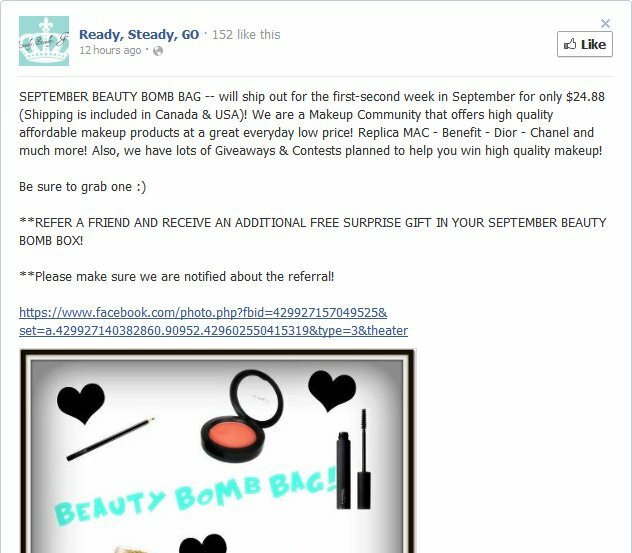 I just thought "when it is too good to be true" and it was .... also if it is a good deal like the new 10 dollar glam bag by ipsy the likes do add up fast and multiple reviews pour in. I appreciate the work you have put into this and have followed your blog for many months. Thank you again. It's private so she can post in her defense. By blocking everyone from the outside, she can say what she wants to her subscribers and not allow the people whom she discusses to be able to defend themselves. Her blog will be back, with that post deleted. So, she has no right to talk about sneaky behaviour when she is doing the same herself. i dont know this blogger or anything about the situation, but after reading all of this i feel inclined to comment about how much i despise people who get into blogging for free stuff or to dupe others. some people are just born shady. I am a respectable person in my community, family and group of friends. I also hold 2 degrees of which one is in science. I noticed education is important to you since you have mentioned your unfinished chemistry degree in the beginning of your post. In my life I was always taught to try and treat people with respect, dignity and kindness. Through my studies and long life experiences I have also learned that when one does not feel happy or fulfilled with his/her life they try to project their unhappiness onto others and make others feel unhappy. Reading your comments one must wonder how many of the interpretations given to those things are real and how many are out of dislike. Although, it was done with the intent to help and worn others. You seem to have spent a lot of time and energy on this subject when you could have done something more constructive (such as completing your degree…) . However, the way you expressed yourself and misspelled some words proves that you are not a kind soul but one full of anger. The book of Sirach says, "Jealousy and anger shorten life, and anxiety brings on premature old age" (30:24). I thought I would leave you with this tip since you are all so concerned with beauty. Boy, is there's a lot of things I'd love to say in response to this passive-aggressive comment. Starting your comment off by attempting to prove how much better you are than the author says a lot about you, and your assumption that "in the middle of a Chemistry degree" means "unfinished Chemistry degree" does as well. Perhaps you should take a step back and look at your own soul before you go and judge others about theirs. Thank you Heather! I am actually WORKING on my third degree (chemistry) at the moment. It is unfinished because I started back at school this past September. I have really made very little comments in this blog post. Most everything was statements of "this is posted here, this is posted there". And if there is a spelling error, I would kindly ask that you point it out to me as I can not see any (I did a quick read through after reading your comment). I am the first to admit my spelling/grammar are not the greatest (thank goodness my degrees have all been science and not arts based!!). I would be happy to correct any typo you can point out to me! Lucia, for someone who is quick to criticize the writing and actions of others & point out how many degrees you have, I might encourage you to in the future proofread your own postings for spelling and/or grammatical errors. I think PolishJinx would like to warn others, not worn them. Also, for conversations sake, why does it matter how many degrees you personally hold? Does it make you a more credible source or your opinion more valid? It is interesting how you all missed the entire idea of being kind and treating people with respect. You have taken my response and once again you tried to turn it into something negative. Well ladies keep on wasting your energy and time on negativity and maybe one day you will find peace and happiness. It was your negativity that made me respond to this blog. I followed the comments and wanted to see why another woman or blogger was treated with so much anger. I still don't understand the reason because what you are arguing about is something that a whole world is doing. So step outside the box and try to be nicer to each other and if you don't have anything nice to say don't say anything at all. Also, if you paid more attention to my comment you would have understood the fact that the reason I mentioned my education was because I felt this was of great importance to the blogger. One of the very first things she talked about was her unfinished degree in chemistry. I will end my thoughts wishing you the best in blogging and may the good force be with you. Since she is now a moderator, you can now report the group! It is possible whoever is on her side isn't convinced yet, and you should be sending them proof. Oh, and try not to use foul language and misspellings (spell check is in most browsers by default) when you are trying to prove a point, it makes you look less credible. Why would you have to teach a mature woman with education not to use foul language. Decent people know not to do that and they don't need to be taught. You teach a child not to swear but you cannot teach an old dog new tricks. Maybe you should teach her anger management. I don't understand WHY and HOW she became a moderater and WTH, why would you be banned? This Ashley girl reeks of fraud/fake. It will all come around full circle and when it does, you will be able to say....I tried to warn you!! the problem with all the bloggers is that they don't really know each other and just jump to conclusions without doing their homework. Read before you talk and remember this could also be adult bullying at its best. This are women that never grew up. I have absolutely received products for review myself! I always mention that in the post and see nothing wrong with it. 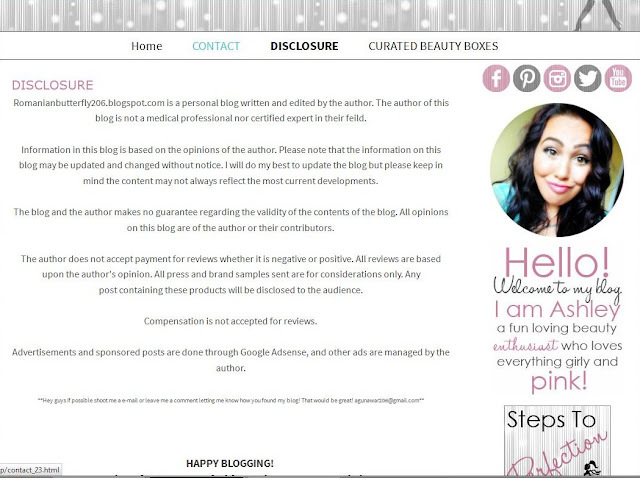 If however your ENTIRE blog consists of nothing BUT free items I find a big issue with THAT. If you are not willing to spend your own money on any of these things, why should I? When every box is reviewed once, and only once, you obviously DID NOT like it enough to subscribe yourself, so why should I? And if you hound and hound a company for free items, and they choose NOT to send you free products, or chose not to KEEP sending you free products, I do not think that is worthy of a 15 minute plus rant on youtube. Oh boy, I re-read my comment and realized it came out not quite right. I have no problem with people receiving items to review, it's a great way to get more information and an honest opinion about the product from someone like me. There's been a lot of chatter lately about the legitimacy of those reviews, but I don't see any problem with it, especially if the reviewer isn't endorsing the product just because they got it for free. What this person is describing? Totally an illegitimate review, and I wouldn't take anything she says seriously because it's obvious that her review is 'bought', and that's not the companies fault either. I've noticed that many make-up "guru's" only ever review one box. So you are not alone in that. So why are you ladies still wasting time and energy reading blogs or haven't you learned that nothing is 100% safe and legit on the net? thanks for spotting her and doing what you are doing, your one of the few blogs that I do read all the time. In all honesty, I think you care way too much about what other people do. You've had so many blog posts in the past about things/people you haven't liked where you post snap shots and do a play by play about the drama. Why do you care? I just think it's hella petty to do it. PS. This won't let me post with my name, only anon for some reason. My name is Sarah.